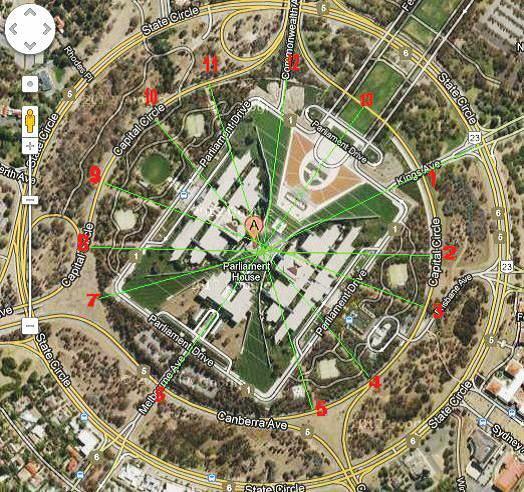 Australia’s capital and Parliament House are encoded with esoteric symbolism, hidden in plain sight. What are the secret meanings and what purpose does it really serve? As a background for those unfamiliar with the Australian Capital Territory (ACT), it is located in New South Wales (NSW), 280 km southwest of Sydney, with the city officially named Canberra on 12 March 1913 by Lady Gertrude Denman, the wife of the then Governor-General of Australia. The ceremony took place on Kurrajong Hill, which has since become Capital Hill. The indigenous word Kurrajongmeans ‘beautiful tree’. The origin of the word ‘Canberra’ is a matter of dispute. Possibly it comes from the indigenous word Nganbira, a phonetically anglicised version meaning ‘the hollow between a woman’s breasts’. This clearly describes Canberra as a plain between the mountains, probably Mt. Ainslie and Black Mountain. There are other variations to the origin including Camberri, Nganbri and Kamberra, all of which mean ‘a meeting place’. According to Steven Guth in his article ‘Canberra: Its Geomantic Realities’, the capital has interesting geology of a limestone plain riddled with caves, caverns, sinkholes and a large water mound. A competition was held for the building design of the new Parliament House, the winner a New York based architectural firm by the name of Mitchell/Giurgola. The onsite works were directed by Italian born architect Romaldo Giurgola (who now resides in Goulburn, NSW) with a design burying most of the building under Capital Hill, capped by an enormous spire holding a large flagpole. The design encompasses two opposing boomerangs that symbolise open arms and the facade includes some elements of the old Parliament House. Construction on Capital Hill commenced in 1981, and was intended to be ready for Australia Day on 26 January 1988, the 200th anniversary of European settlement in Australia. Finally the building was opened on 9 May 1988 by Queen Elizabeth II. 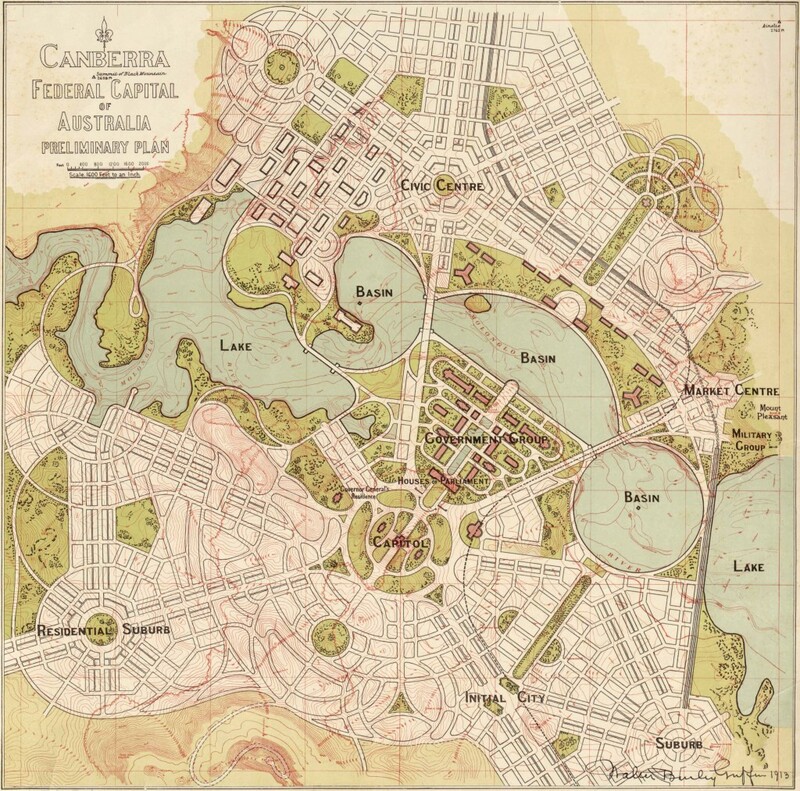 Much of the original ground layout of the parliamentary site is the work of Sir Walter Burley Griffin and his wife Marion, both originally from the United States. Walter was an advocate of design in harmony with nature, while Marion an accomplished artist influenced by mysticism and spirituality. Their final design, dated 1913, is based on ancient geomantic principles, with the layout oriented in a cross-shaped axis with five mountains (see Figure 1). The north–south ‘land axis’ stretches from Mt. 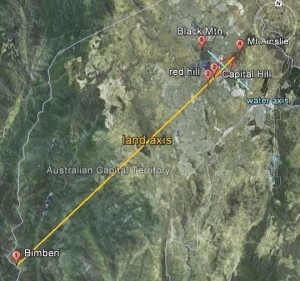 Ainslie to Capital Hill to Red Hill to Bimberi Peak, while Black Mountain forms the east-west ‘water axis’, thereby creating two equilateral triangles with one tip on top of Capital Hill and the other on top of Mt. Ainslie. Of course, the three internal angles of an equilateral triangle each equal 60 ° (or 60 °-60 °-60 °). There is a further numerical connection here, with the compass bearing of the land axis pointing south at exactly 216 ° (or 6 x 6 x 6 = 216). Moreover, each sign of the zodiac spans 2,160 years, which is also the approximate diameter of the Moon in miles. In addition, 360 âˆ’ 216 = 144, the number in the Gematria for ‘divine light’. A check of a Canberra street map reveals that one leg of the parliamentary equilateral triangle is 2,880 metres in length. This means that each equilateral triangle has a perimeter length of 8,640 metres, while the ‘bringer of light’, the Sun, has a diameter of approximately 864,000 miles. This demonstrates some of the cosmological ideas at play in the design. 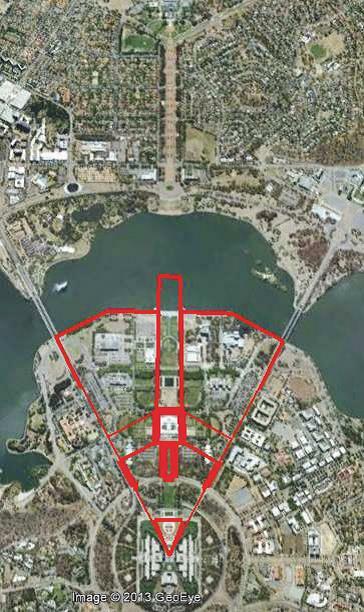 In Peter Proudfoot’s book The Secret Plan of Canberra, he points out that the double ring around Capital Hill is consecrated space and therefore the site is of a templum (temple). Not mentioned in his book is the fact that the facade of the building (Figure 2) has a cut-out ‘T’ with the Coat of Arms inside it. This ‘T’ is a Tau symbol representing the temple. In the culture of the Maya, this symbol is the Sacred Tree (Te) (as in Figure 3) and the axis mundi, or centre of the world. This aspect has Masonic overtones when we consider the central pyramidal structure and flag pole that spans 81 metres. This number appears not to be arbitrary. Why not round it off to 80? No reason is given for this choice. In that case it has a hidden meaning, accessible only to ‘those who have eyes to see’. The number 81, as well as being associated with the 9 x 9 magic square of the Moon that adds to 369, is a centred octagonal number. Later in the article we’ll see a much deeper meaning to these aspects. The facade is also of interest as it has a double Triptych (triple temple doorway). Notice below the cut-out ‘T’ the three archways and the setback of two other sets of archways? Triple doorways are a common feature of ancient temples, Maya pyramids and Masonic lodges. The arches are also numbered from left to right in the order 5-4-3-4-5, which is the ancient Egyptian solution to creating a 90 ° corner from a right-angled triangle with knotted rope in proportions of 3, 4 and 5. So here we have a measure of two virtual triangles formed into a virtual square – perhaps the square on a Masonic tracing board. We can extend the Masonic connections further as there is an unusual configuration on either side of the flag pole. Two square pyramids have a glass rectangular ‘monolith’ rising vertically out of them above the chambers of the Senate and the House of Representatives. Are we seeing the quadratic pillars of Jachin (Establishment) and Boaz (Strength)? In Freemasonry, this conveys: ‘In strength shall this House be established’. Figure 4 shows one panel above the House of Representatives chamber and has an inverted ‘M’ in the way the skylight is constructed. Positioned in the centre is a double equilateral triangle. The panels probably light up at night like a beacon to show where the Senate and the House of Representatives are situated. Note that the skylight above the Senate chamber is circular while (in Figure 4) the skylight is square. Again the symbols are firmly related to the two Masonic pillars, the circle representing the zodiac ecliptic or etheric realm, the square representing the Earth or temporal realm (square). Many have speculated on the ground plan as encompassing the ‘all-seeing eye’ and uncapped pyramid, as appears for example on the US one-dollar bill (see Figure 5). It seems there are possibly two stylised uncapped pyramids with a radiant all-seeing eye. One thing is clear: there are 13 steps up the lawn to the front facade and 13 steps down the other side. I can therefore understand the similarities to the US dollar symbolism. The paths and roads leading through the inner ring tell the same story. As you can see in the satellite view (Figure 6 – below) there are 13 points through which one can enter the inner ring. Of course, 13 is a sacred number to the Masons, the Maya and in the Kabbalah. Thirteen is a natural focus around which 12 others gather. For example, King Arthur had his 12 knights and Jesus his 12 disciples. Also, 13 is a structural number in nature. For example, the Moon cycles around Earth 13 times a year, and the pine cone has a spiral ratio of 8:13. But here again, this number is taboo to the ‘uninitiated’; it’s only the ‘initiated’ who fully understand its potency. 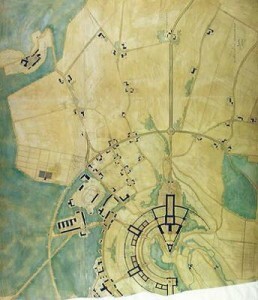 Careful thought has gone into the Parliament House design using elements of the Griffins’ plan. The interplay of the ring roads and the flagpole at 81 metres reveals an important narrative. The diameter of the outer ring road is 972 metres (81 x 12 = 972) and the inner ring road 648 metres (81 x 8 = 648), a combined 1,620 metres or 20 times the length of the flagpole (81 x 20 = 1,620). This is phi (rounded off to two decimal places) at 1.62, which is roughly the same as the ratio of the inner and outer ring (rounded off to three decimal places) at 0.666 (8/12 = 0.666). The ratio of the circumference of each road is approximately 2 km and 3 km or 3:2, which is also a perfect fifth in music. It is also significant to note that (5 x 162)/10 = 81. Harmonically, the flagpole height resonates with the diameter of the Earth when the flagpole height is cubed and multiplied by 24 ((813 x 24)/1000 = 12754.584 km – which is within 1 km of the Earth’s diameter). We can extend this further by saying that the number 81 is also a harmonic octave of the 25,290 year precessional cycle by doubling it 5 times ((81 x 2 x 2 x 2 x 2 x 2) x 10 = 25,920). In the photo marked Figure 7, we have an image of the six (eight-pointed) Maltese crosses that hold the flagpole at Parliament House. The cross is the insignia for the Knights of Malta, an organisation headquartered in Rome. 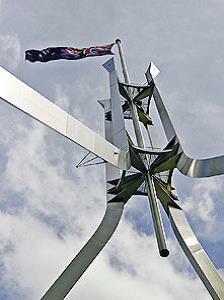 In the context of an Australian iconic constitutional building, the sculptural spire elements are inappropriate in that they symbolically confer a higher status on another institution. That the flagpole is cut off from the ground – as opposed to being grounded – indicates, from a geomantic standpoint, that the Australian flag has no sovereignty over the land it represents. 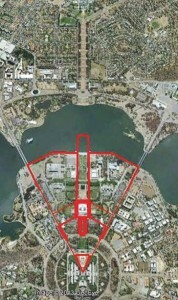 The narrative in the geometry and numbers indicate the Knights of Malta are holding not a flagpole but a rod of power that secretly claims dominion (24 hours a day) over the area of the ring roads around Parliament House and, via the diameter relationships with the height of the rod, the Earth itself. It is noted that on the Australian Coat of Arms depicting the six states is a St Andrew’s crown backed by a Maltese cross representing Queensland. Yet not even the Queensland Government has an explanation for why the cross was chosen for their Coat of Arms. The Griffins’ design axis strongly references the vesica piscis, out of which is created the circle, triangle, square and other polygons. In medieval times the circle, square and triangle represented wisdom, strength and beauty. The double ring surrounding Parliament House and its parliamentary triangle have cosmological connections to the double ring of Stonehenge and associated equilateral triangle created by the juxtaposition of Stonehenge, the mound of Old Sarum and Grovely Castle, the triangular base representing a solstice line. I ran a great circle line on Google maps from Stonehenge through the tower on top of Black Mountain at a heading of 63.96 °. 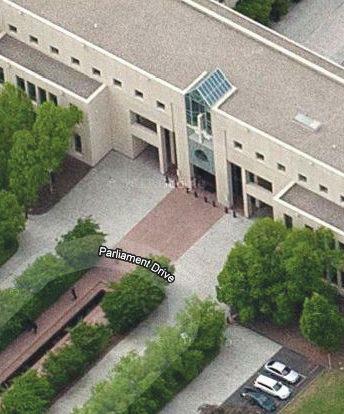 I discovered that the line falls on the old Parliament House building, within the centre of the parliamentary triangle. As mentioned earlier, the measurement of each leg of the triangle is 2,880 metres; this is implicit in the Griffins’ desire to match the Aubrey Circle at Stonehenge, which is 288 feet in diameter – the same numbers, yet a different measurement. In addition, the two equilateral triangles have a perimeter length of 17.28 km. The significance of this number, according to Martin Doutre in his article on Stonehenge, is that the dynastic Egyptian royal cubit was exactly 1.728 feet, while 1,728 is an important navigation number and a multiple of 12 (123 = 1,728). When 1,728 is multiplied by the number value for ‘divine light’ we end up with 24,883, which is within 18 miles of the official equatorial distance around Earth ((17.28 x 144) x 10 = 24,883). The principle of ‘as above, so below’ (cosmic symbolism) is implicit in the landscape and buildings, with the circle representing the heavens and the cross related to the square representing the Earth. The House buried within Capital Hill could be considered as representing the primordial mound out of which creation arises. Certainly the two ring roads around the hill paint a picture of the cosmic egg. 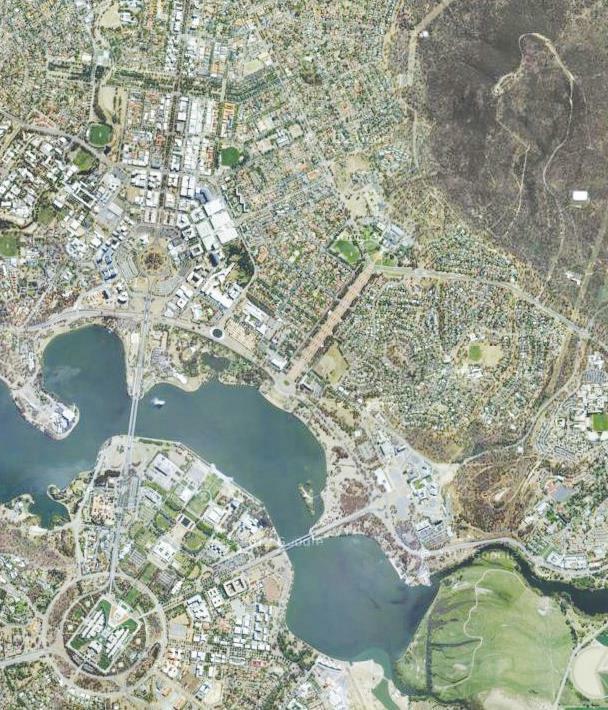 It’s worth taking a look at the Google maps satellite view of Canberra because an interesting image emerges which cannot be seen from ground level. In Figure 8, if you look at the top of Mt Ainslie, you’ll see a pathway that looks like a serpent (top right-hand corner), its head pointing directly towards Parliament House. When viewed along with the ‘cosmic egg’ and ringed circle with the ‘X’ in the middle, there emerges an impression of the egg and the sperm of creation. The narrative presented in the landscape is also akin to the biblical Moses holding a staff with entwined serpent; or, perhaps, as in the Garden of Eden, the serpent in a tree (the Tree of Knowledge), the tree represented by the Tau in the facade or the cross formed by the Griffins’ land and water axes. Or are we looking at the true rulers of a Draconian (Reptilian) nature hidden in plain sight, where our nation’s rulers pay homage to a literal higher power? 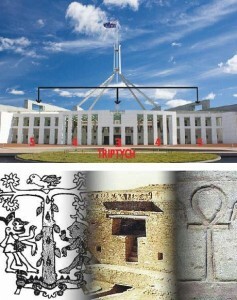 According to this interpretation, both opposing equilateral triangles drawn by the Griffins confer the power at the apexes and the highest point is Mt Ainslie and the flagpole (rod or staff) held by another institution. Strangely, at the rear of the building on Parliament Drive, situated above the entrance, is an inverted Petrine Cross (shown in Figure 9). This symbol is traditionally the upside-down crucifixion of Saint Peter, but has since been adopted by modern Satanists and heavy metal bands. One wonders if this is another link to Rome or to deeper occult roots. Why is this symbol on an Australian iconic building? 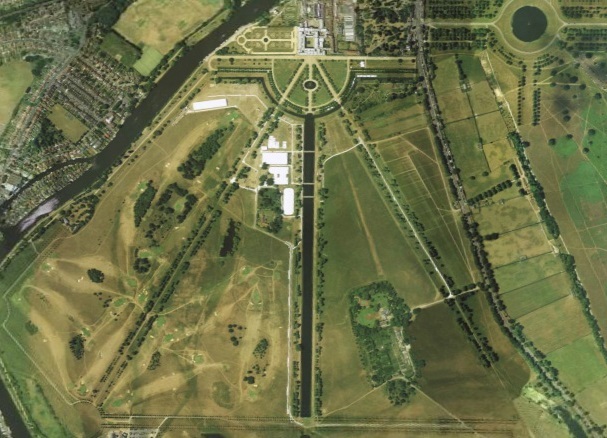 The overview of Canberra and the parliamentary triangle reveals a striking similarity to the proposed design of a complex by the Nazi leader Heinrich Himmler, as described by the late Philip Coppens (shown in Figure 10 and Figure 11). The design, dated circa 1934, was based on the Spear of Destiny, with Wewelsburg Castle at the tip. These images demonstrate that the Nazis and the Griffins were very much aware of Teutonic mysticism. The geomantic connections with both designs are based on the power of the triangle, while the Spear of Destiny is a symbol of power and authority. It should be noted that Canberra’s Australian War Memorial also lies on the north-south land axis below Mt Ainslie, connecting the past with the present and future. It is a symbol of what the nation is founded on, the struggle and sacrifices made by many people. They might be shocked by the way our nation’s sovereignty is supplanted by out of context symbolism. In all fairness it has to be said that the designers and approvers of the day were cognisant that placing a building on top of Capital Hill would be seen as looking down upon the masses and separating the legislature from the people. Still, this is far from what the Griffins envisaged, which was to integrate the spaces by using a triangle to separate the city’s functions, with City Hill for the business section, Capital Hill for administration and Cathedral Hill (now Peace Hill) for the spiritual functions. A tram line was to link each of these parts; but unfortunately this wasn’t constructed, so Canberra appears ‘soulless’ – a common criticism of many visitors. However, this is balanced in my opinion by the protection afforded from the outer mountains and the triangle of inner hills that maintain a sense of spirit from the landscape. Hidden Symbolism in the New Parliament House: What Does it Mean? I have to say that what I found in my research is much more than mere geometry; it is clear that there are esoteric symbols etched into the landscape and the buildings. It appears that the Griffins’ dream was to recreate aspects of an ancient golden age or perhaps a desire for a return to one. Sadly I think their utopian dream has turned into a nightmare and an example of history repeating itself. The Ngunnawal people, the indigenous inhabitants of Canberra, were displaced by European settlement over 200 years ago. Now, I find the Australian peoples’ sovereignty and governance is being displaced in a symbolic form by out of context structural icons that have nothing to do with what is uniquely Australian. For example, the dominating pyramid spire and ‘flagpole’ is really a 220 tonne rod of iron denoting rulership. It is held in place by six insignia of the Knights of Malta, suggesting that they hold dominion over the parliamentary precinct. 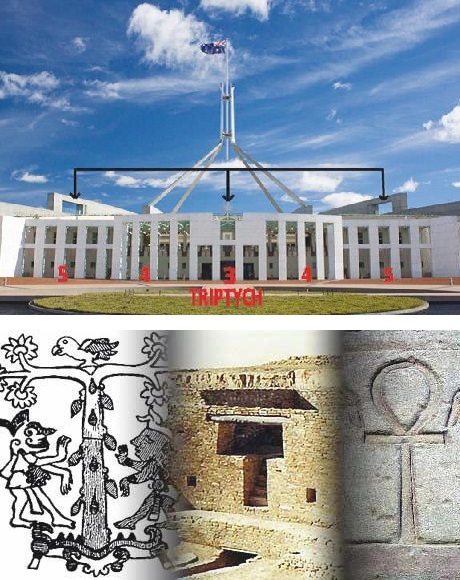 Another symbol that stands out, with its strong connections to Freemasonic, Egyptian and Kabbalistic traditions, is the ‘T’ above the entrance of Parliament House (Figure 2). The Tau symbol is as old as time and Freemasons always mark their work with this symbol. The water and land axes created by the Griffins (Figure 1) and the orientation of these axes to a ‘serpent’pathway on Mt Ainslie (Figure 8) tells us there is a narrative we’re not privy to, one restricted to the ‘initiated’. The Parliament House design with its 13 steps seems akin to a stepped pyramid. This gives the impression that the site isn’t about the people as the Griffins intended, but was usurped by the notion that the House is for the elite and in occult terms is grounding the symbols of authority and control. Like temples and pyramidal structures, it is the preserve of royalty, high priests and ‘initiates’. While this may not mean very much to visitors or staff at Parliament House, or to the average Australian, they would view the site very differently if they were aware of its deeper symbolism. The lesson here is that everything is connected (by will, purpose and intention). As such, manifestations even in symbolic form are given power through the landscape in an elemental form and connect to a higher power with its roots in cosmology – ‘as above, so below’. Peter Proudfoot, ‘The Secret Plan of Canberra‘, University of New South Wales Press, 1994. Steven Guth, ‘Canberra: Its Geomantic Realities’, New Dawn 94, January/February 2006. Steven Guth, ‘Canberra & the Griffins: A Theosophical View’, 2002. Gary A. David, ‘The Tau (or T-shaped) Cross: Hopi-Maya-Egyptian Connections’, 2006. Philip Coppens, ‘The Wewelsburg: The Nazi Grail Castle’. ‘Parliament House Vista Area Heritage Management Plan’, Vol. 1. ‘Masonic Pillars of Jachin and Boaz in Relation to Cosmic Polarity’. Susan AKA Peacefull, ‘Canberra: Cosmological Symbolism of Mysticism’, October 2011. Trevor Wardlives in Western Australia and has been studying metaphysics for more than 25 years with an interest in sacred geometry, crop circles, harmonics and ancient structures. He is the author of ‘Secrets of the Great Pyramid’ published in New Dawn 117, and ‘The Secret Message of Barbury Castle Crop Circle’ published in New Dawn 121 & 122. The above article appeared in New Dawn 138 (May-June 2013). © Copyright New Dawn Magazine, www.newdawnmagazine.com. Article reproduced with consent. Water authorities rolling out wireless smart meters! Was Our Solar System Designed to Produce Humans? St Judes Medical Australia Pty Ltd is now Abbott. Abbott, life to the fullest. I am a recipient of one of your medical devices. The device was implanted into the top of my left breast on July 27 2017. Even today I have very little certain information about this device, only that it seems to have turned me into an invalid. I have endeavored to gain information from the persons who implanted this gadget into the top of my left breast, alas no one of these persons, responsible for my being made invalid as a result of your gadget is forthcoming with any acknowledgement or concerns as to my depleting state.Every day I fear for my well being. I would be most grateful if someone from your company could help me. Today, it was made ever so clear to me, by a certain caring cardiologist, that I was not welcome at The Royal Melbourne Hospital. Gosh & I thought they cared about the elderly & disabled in need. My younger sisters – the witness throughout – impassioned plea for pity, fell on deaf ears & we went home – thus disenchanted by the lack of the milk of human kindness.